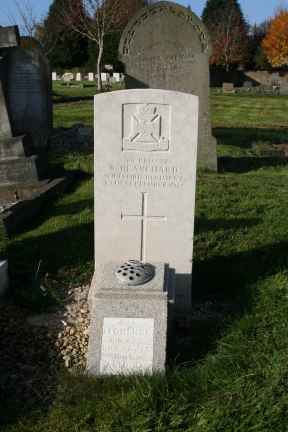 Pte Blanchard died at Tidworth aged 37. He was the second son of CSgt Blanchard. He had served with the Northumberland Fusiliers and later on the permanent staff as Devizes and had served in the Coldstream Guards. On leaving the Army, he worked for Chippenham Signal Works. When War broke out he rejoined the Colours and was drafted to the C Company, 6th Wilts, Kitchener`s Army, stationed at Tidworth. On Saturday 26th September 1914 he collapseed with a cerebral haemorrhage and died the next day after seeing his wife Florence and other relatives who had been brought from Chippenham. At the time of his collapse, he was cleaning his uniform ready for a visit to Chippenham. Being the son of a soldier, he was born in the Woolwich Barracks and died in Barracks. His younger brother is a signaller serving in France. Relatives at the funeral included Mrs Tanner (sister) Herbert Tanner (nephew) and FJ Tanner (nephew). He was buried with full military honours including a firing party commanded by Lt Hartley. Both Herbert and Frank Tanner joined the Army. Herbert Tanner was killed. during the War.